It’s time to show off our 3 ingredient craft. With the 3 items of washi tape, ribbon, and paper. 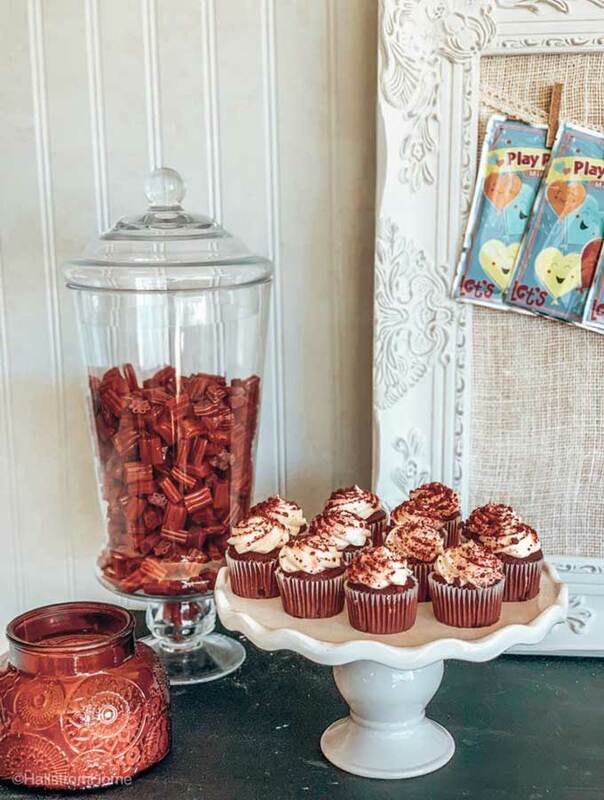 Me and five other bloggers had to come up with a Valentines related craft with those 3 ingredients. What I love about this, is that we all came up with something different and unique. 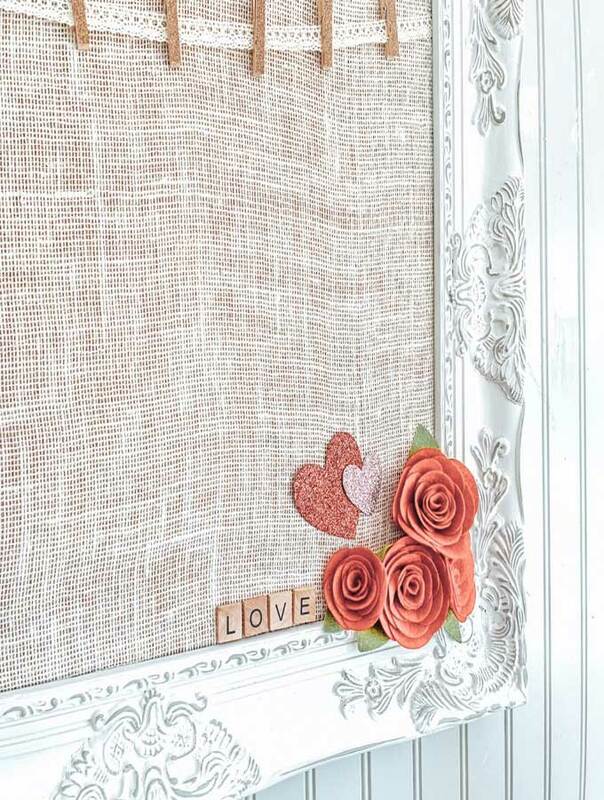 Below is my Fabric Covered Bulletin Board-Fast & Easy DIY. Creating with 3 items can be difficult, but it so much fun to see what you can come up with. 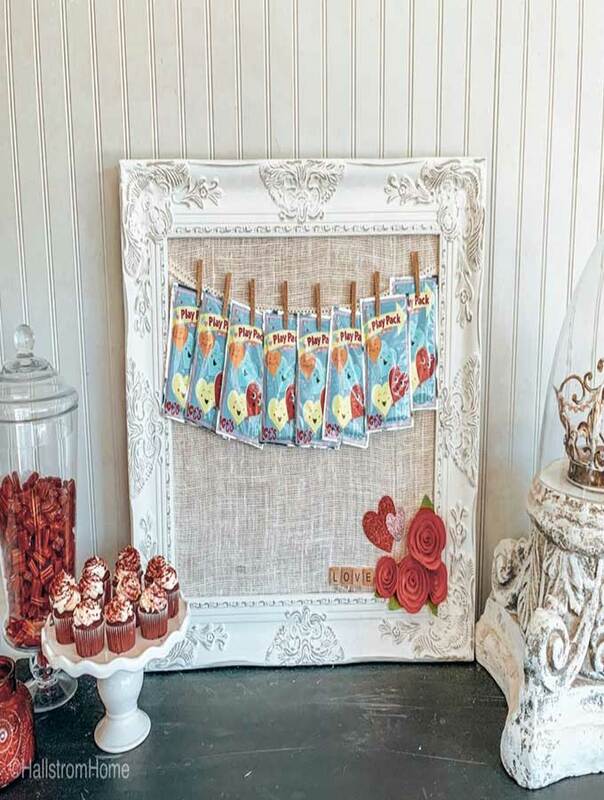 I will share with you the five other wonderful bloggers and at the bottom of the post will be my tutorial on how I created this bulletin board. Look at this darling wall decor Tauni made. This is so cute and the perfect touch for Valentine’s Day. Look what you can do with just those 3 supplies! Who would have thought you could make something so cute? 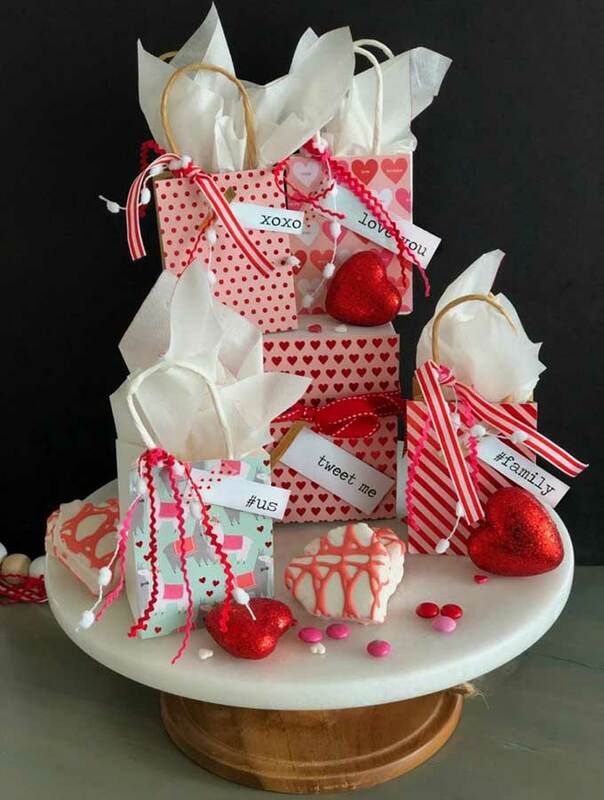 Simple Valentine’s Day Gift Ideas are great for Valentine’s parties. But what makes them so much fun is having a Printable with Typewriter Sayings. I know my kids would absolutely love these fun and sweet sayings. The washi tape always adds a special touch to the projects. 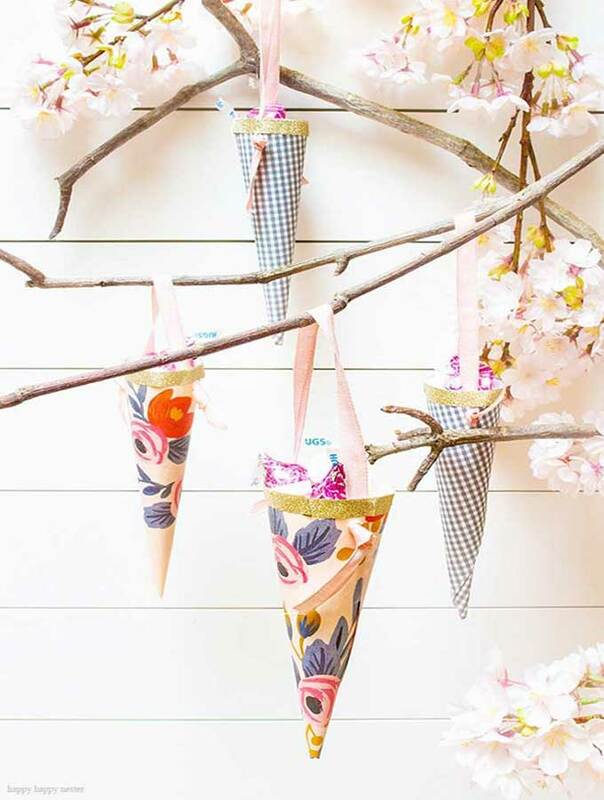 Learn how to make easy paper cones for treats for Valentine’s Day this year with Janine. My daughter would love these for her Valentine’s party. They are so easy to make and you can make them any way you want. Just grab some of your favorite paper and get started. 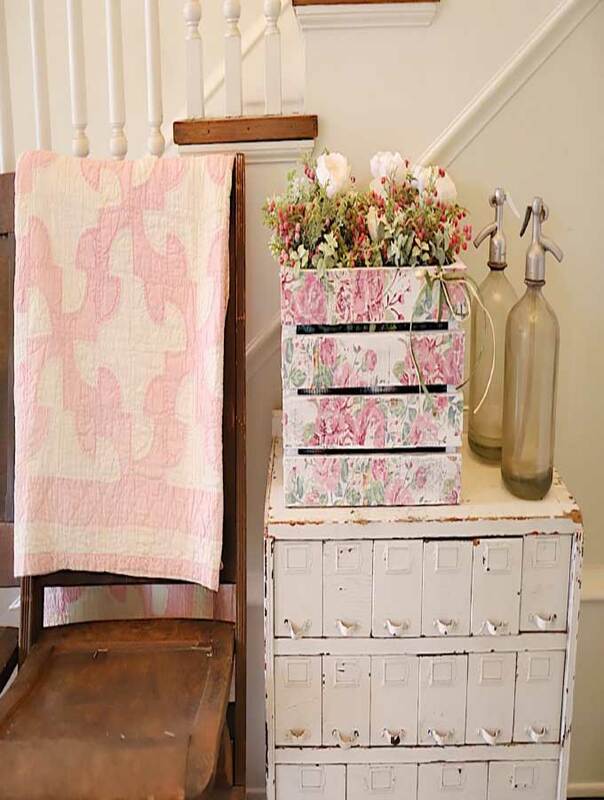 Leslie created this Valentines Day decor flower holder using a wooden crate, flowered paper napkins, and lots of glue! 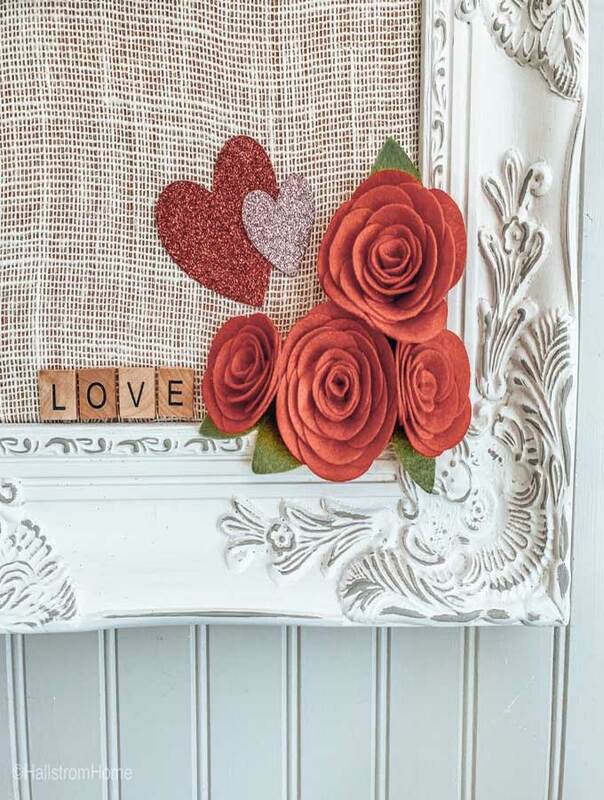 I love this diy because it is cute and perfect for Valentines day. But I think this could be used anytime of the year! Those kind of projects are some of the best kinds. Ashley created this fun DIY book page banner for Valentine’s Day. 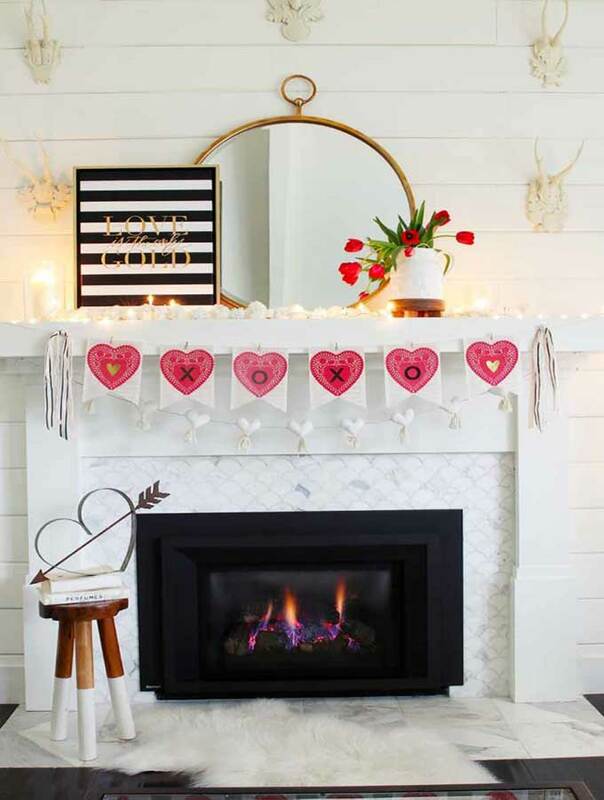 This is a great addition to your home if you want to add a simple Valentine’s day touch. Here’s what I created with the 3 ingredients of washi tape, ribbon, and paper. I created a fabric bulletin board with a banner. To start I covered my clothes pins in washi tape. Washi tape is not that sticky, so you will not want to handle it too much. If you follow me over on my Instagram you might have noticed I was pronouncing washi tape wrong. I was soon corrected, so now I actually know how to say it. I still like my way better though. This is actually a cork board covered in burlap. To get the burlap on, I first cut it to size. Then adhered it with a spray glue. What is great about having cork board underneath is that you can pin items to the board. That’s something I really like about this easy diy, is that I can hang things from the clothes pin but also pin them up on the board. Across the board I used the second item which was lace ribbon. 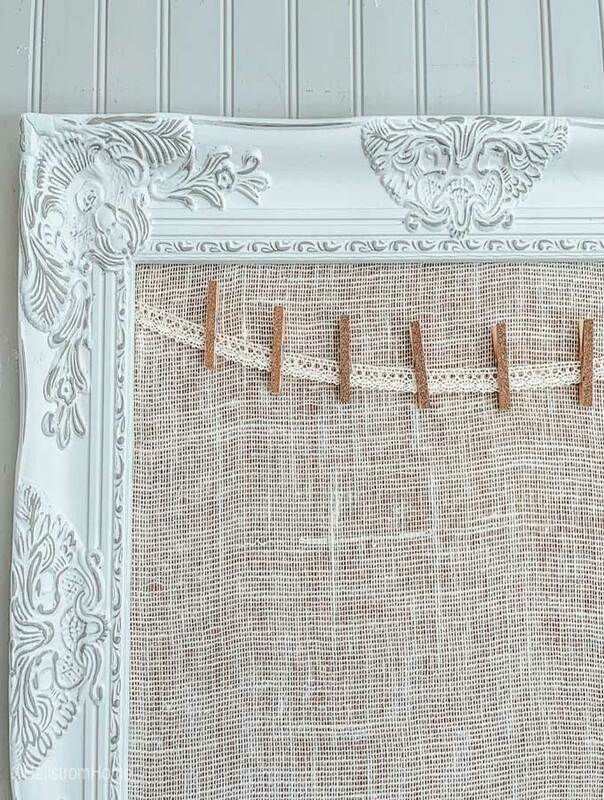 The ribbon is perfect to hang the clothes pins from. The lace is just a simple touch that I love. This is our grey and white frame, this style is our most popular farmhouse mirror in our shop. 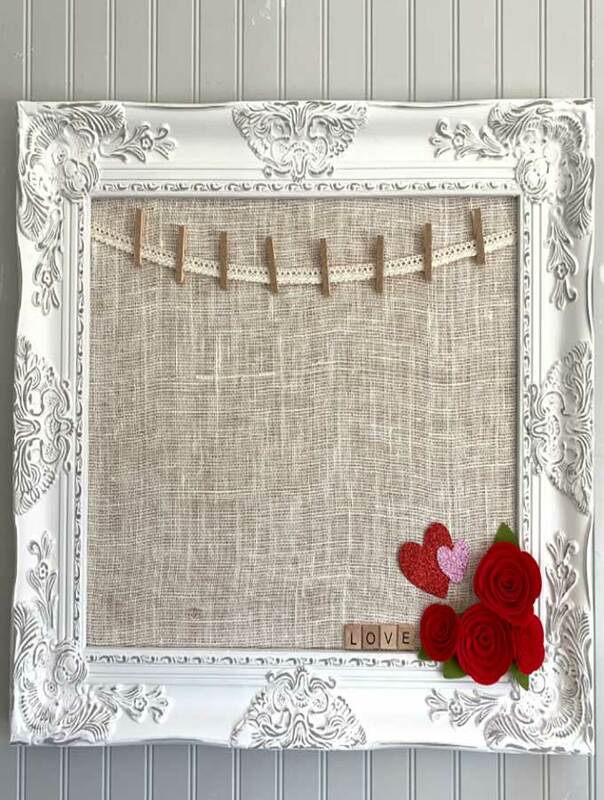 I thought this frame was perfect for this Valentines board, with the soft grey and bright white. Next comes the third ingredient, paper. I added some cute, glitter hears in the corner of our board. It was the perfect touch to our Valentine’s bulletin board. But I couldn’t do just paper hearts. Adding some felt roses was another great addition as well as the Scrabble letters spelling “love.” If you’re the crafty type like me, you will enjoy this chandelier makeover done in minutes. 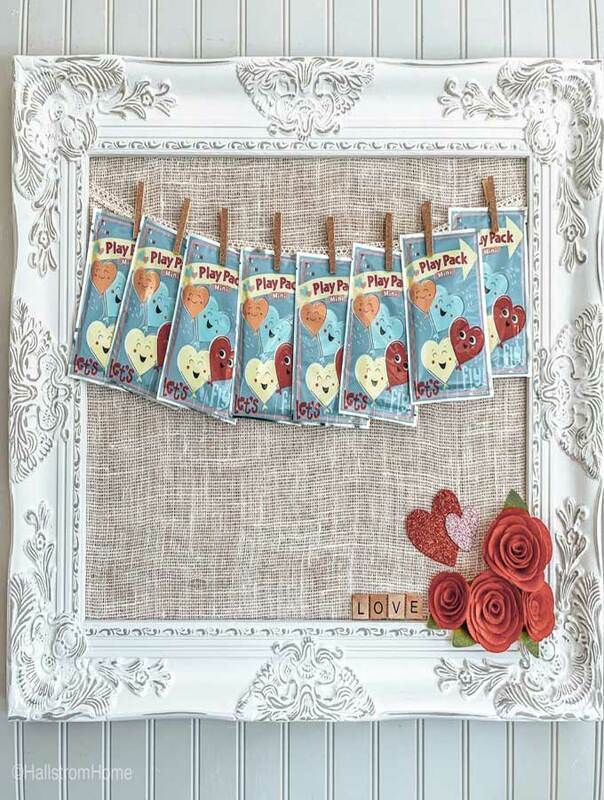 I hung up some play packs, great for a Valentine’s party. The roses and letters were glued up with a hot glue gun. But you could just double side tape them on and use the bulletin board all year long. Of course I had to include a yummy dessert. I just used a red velvet box mix. Don’t tell anyone though! But I did homemake cream cheese frosting. I’m telling you, this stuff is so tasty. 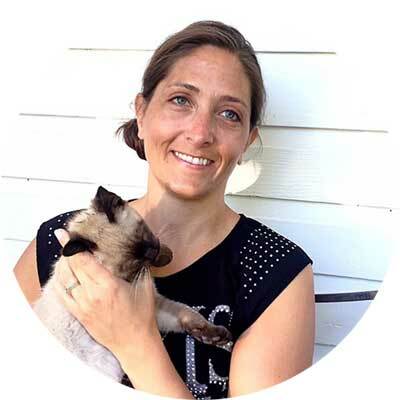 I would love to know what you think of all these wonderful crafts. 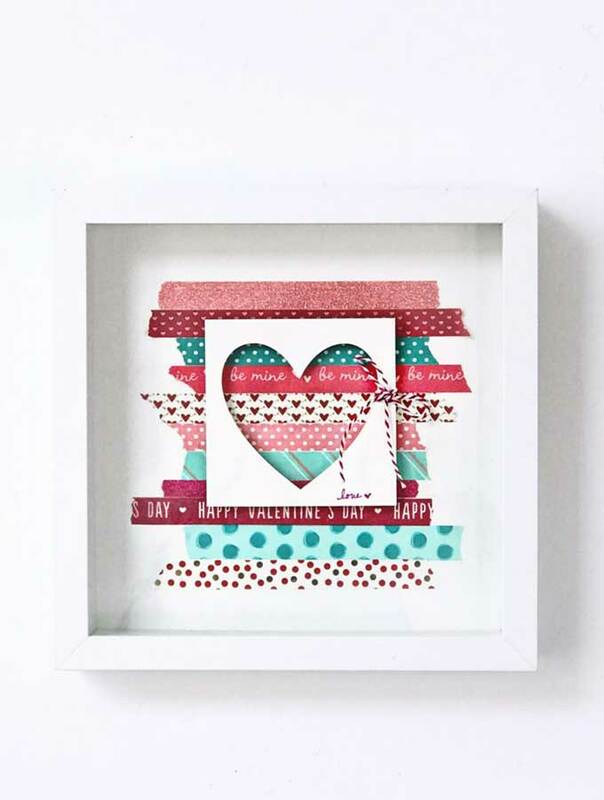 What would you have done with washi tape, ribbon, and paper? Did you make the felt roses? They are the cutest! Nice idea with the bulletin board…you are just so crafty, and I love you for it!